Use this coupon code at checkout to save 25% off relax products from Coffee Blenders. Save 20% on Lean Cup products from Coffee Blenders with this coupon code. Enjoy free shipping on your entire order with this coupon code from Coffee Blenders. Shop sale at Coffee Blenders to save up to 50% off popular products. 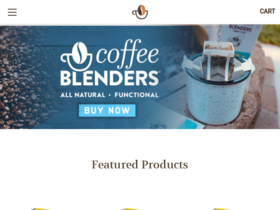 Check out Coffee Blenders online for their latest special offers.